Swan dives, jackknives and cannon balls disrupt the wet mirror finish of the East pool. Splashes striking hot concrete resonate as applause for the aerial-aquatic feats. Stretch out in your favorite chaise lounge with a book from the library (or bring your own). Water music can be piped to poolside. The guitar of Barney Kessel, a House favorite, has washed away many aches. If a standard like “Cool Sunshine” from “East Coast – West Coast Scene” (1955) is not the right tonic, earphones – gratis and hygienic – allow you to sink into carefree slumber accompanied by your own playlist. 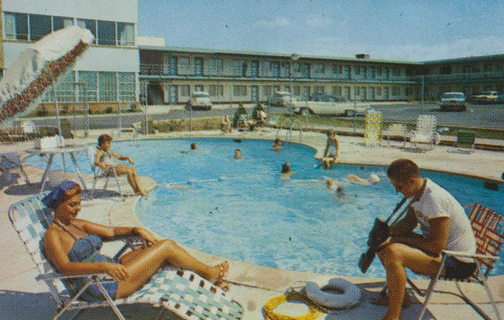 The East is modeled after the pool of the Arva Motel (now a Days Inn) in Alexandria VA, one mile west of Washington, D.C., on U.S. Route 50, whither the Old Man’s parents took their four sons during a vacation in June 1972. While the boys frolicked, a different history was being written on the Potomac in central D.C. – inside the Watergate Hotel. 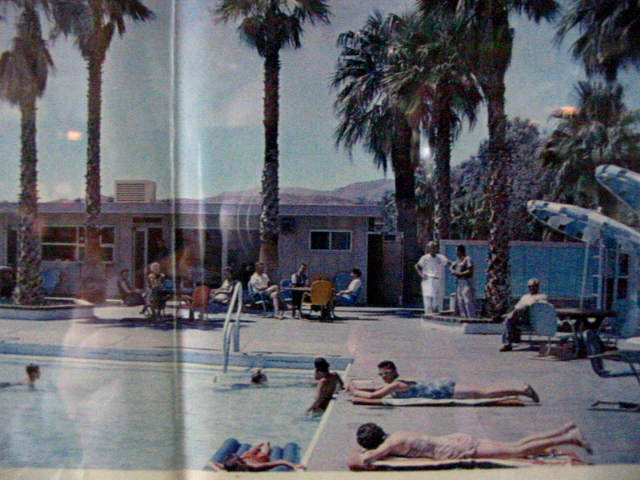 The prototype for the West pool is the circa 1947 watering hole at The Palms in Borrego Springs CA. The names of Hollywood stars from the period haunt the facility. The Golf Widow chooses to commune with Astrud Gilberto’s “The Girl from Ipanema” (1964) and Crystal Waters’ “The Boy from Ipanema” (1996) in addition to the immaterial celebrity presences. The desert inn is also the prototype for a Future Fairway generated by a 3D printer. You don’t have to be a Boy Scout to make a wish inside our vintage tent for Candy Crunch, Chocolate Eclair and Toasted Almond ice cream bars and King and Sundae cones. Good Humor® sold its fleet of trucks in 1976, but the nearest kitchen freezer may contain these restoratives. 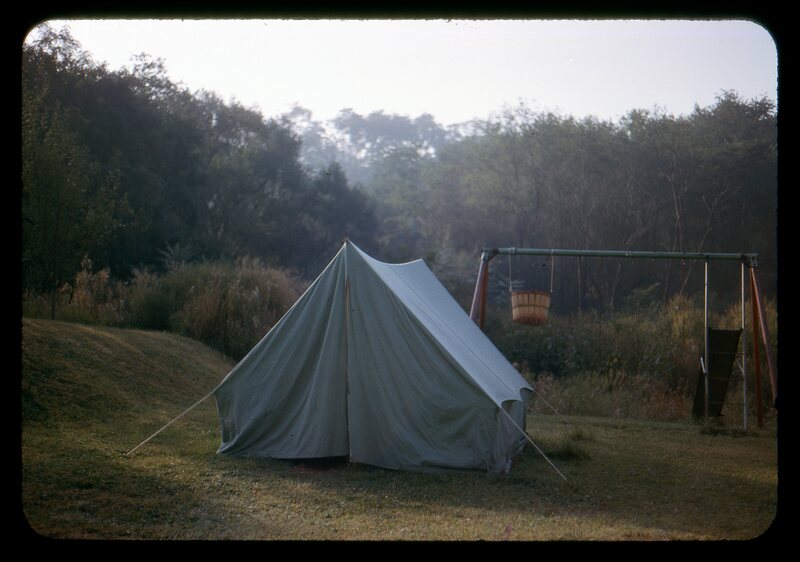 In summer heat intensified by the non-permeable tent, wash them down with the Boy Scouts of America® aluminum, 1.75-quart pot’s municipal water (or cool your forehead with it). 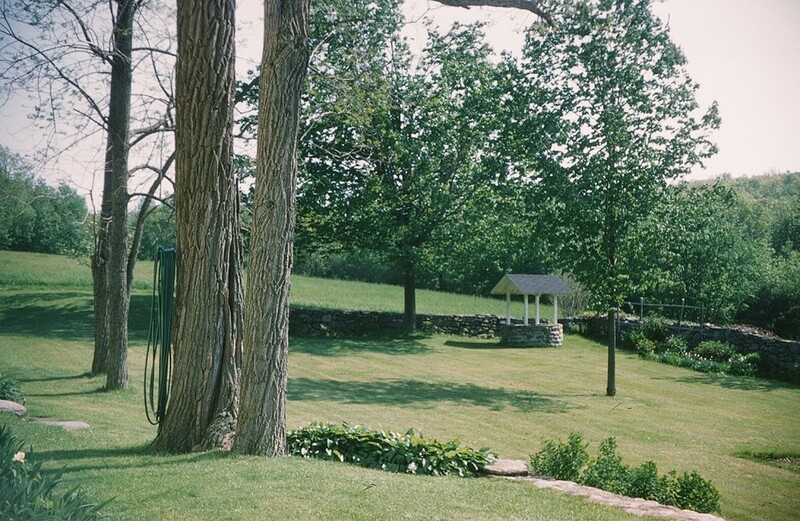 Although the well has not been blessed officially, it is venerated by those who have relished its sacrament of Good Humor and accompanying ablutions. 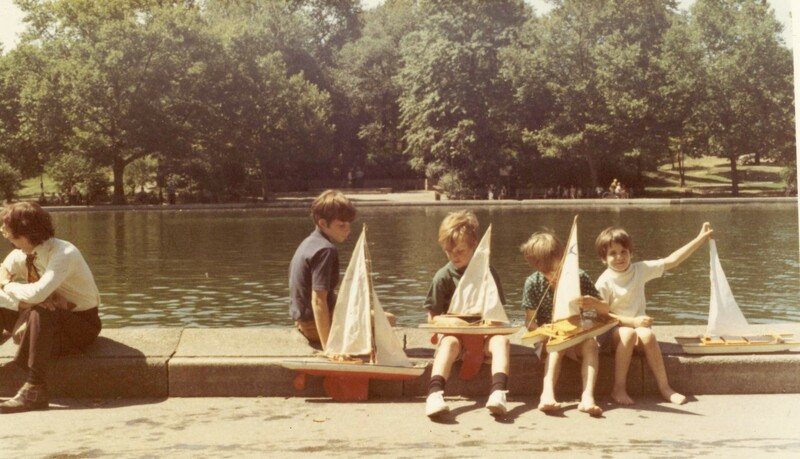 Landlubbers drawn to the Conservatory Water in Aunt Ruth’s Park, aka NYC’s Central Park, by the nautical derring-do of Stuart Little aboard The Wasp. For the unskilled (present company included), this body of water can be a pool of tears (present company excepted), whose source is beneath the Alice in Wonderland sculpture on the north shore.